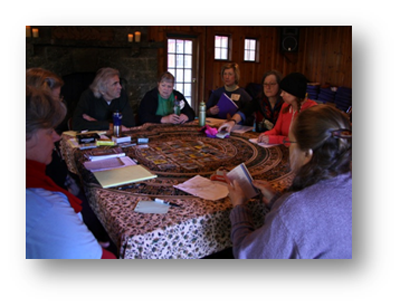 The first NW Astrology & Tarot Salon was manifest on the material plane at Breitenbush Hot Springs during a wind storm and several inches of snow. Throughout the year of planning and envisioning the finished product, I pressed on with my vision, passed multiple difficult draconian obstacles much like Ulysses in the Odyssey. In the end, because of my innate pioneering tenacity, the salon was saved from sinking into the abyss and we will have another in the future. I’m satisfied with the salon event even if it wasn’t the way I had originally envisioned it. From the beginning, the salon has been a challenge to put together. In hindsight, I should have been more considerate of the difficult astrological projections for the year. The entire planning and implementing situations were reminiscent of the Tower card and its chaotic Pluto and Uranus archetypal energies. For example, people that wanted to come suddenly couldn’t right up to the very day of the event. Bonnie Cehovet couldn’t make it at the last minute but donated her cabin so others could….What a gal. We lost two more when the winds of the storm peaked. But, listening to my inner signals and watching the developing trends, I felt I must trudge forward through the pregnancy challenges if we were to birth this difficult baby for future participants. 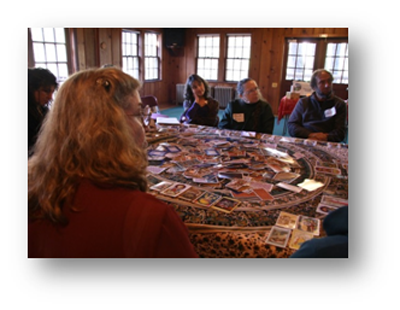 The remaining Conversation Leaders and participants gathered together each day of teaching and sharing. In the end, we all felt a sense of satisfaction of mission accomplished. 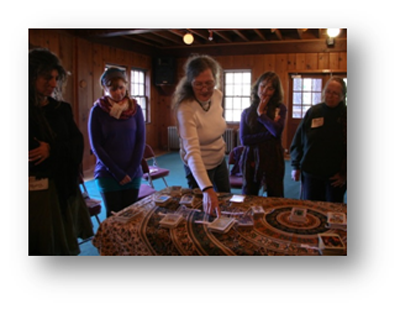 Christine Payne-Towler led us through the astrology and Tarot history which informed us about the importance of both tools to our continuing growth in the area of esoteric arts. Robert Volkmann was a constant support to everyone and read others’ astrological charts, Karen Campbell showed the beginners in the group how to use Tarot cards in journaling, Mary Jo Wevers taught us all about the north and south nodes and how they indicate our life’s path with its challenges….learning what to let go of and what to keep. Alan Stein was another support person adding his insights to the group dynamic. Sara Judy took care of book and deck sales in her bookstore, took photographs and participated in our groups. Of course we wouldn’t have been anything without our participants who were truly receptive of the new, adding their ideas and opinions to the daily conversation circles. They ranged from pure beginners to experienced teachers, and whose energy and enthusiasm kept the exchange vivid and lively. Christine thought that the whole experience resembled a traditional one-room schoolhouse, where the more experienced tutored the new student, allowing the whole group to operate as a coherent learning organism despite our widely differing skill-sets. On personal note, the winds of the storm gave me the opportunity to practice communing with the weather. This is a practice that is noted in our collective history. Examples can be found in the Druid and Egyptian accounts as well as other traditions. I’ve been working with the weather for several years and am now sure that mystics through the ages have communicated and influence weather patterns. My pragmatic husband, Lewis, thinks so too as he has watched and been amazed many times. During the Breitenbush salon experience the winds began gusting so strongly trees began breaking and falling into the foot paths and some fell on buildings. I knew that this was a dangerous time and so I began to commune with the archetypal weather pattern that I knew. When I communed to the weather pattern, giving him direction to calm down, the winds would stop for brief periods but wouldn’t stay that way. During a break in the action at the salon, I went to my summer cabin where I wouldn’t be disturbed. On the way, I said to my friend the weather pattern, “What’s the deal? I asked you to calm down.” He communed back “I’m not the only one here.” Apparently, there were three other archetypal weather forces such as are present in the arctic. Once in my cabin, I looked out at the tree tops and asked the weather to calm down again. As I asked, I felt the calm (that I was asking for) in my being. I could tell by the tree tops that, the communication helped and the winds would die down. However, every time I would begin thinking about something else, the wind would pick up again. This happened three times. I finally decided to be directive to all the weather patterns. Since the weather was obviously masculine, I said, “Boys! Take the winds up above the Breitenbush area and above the mountain side and above the Willamette Valley below us.” The winds stopped for longer periods of time. After giving directions three more times and finally adding an extra protective shield, they complied and took the winds higher up. It became calmer on the mountain. I felt safe and slept through the night. However, I am a novice with the weather patterns. We woke up to several inches of snow the next morning. The night before, I asked for a light sprinkling but apparently I wasn’t speaking to the right weather pattern. Overall, I believe we all enjoyed this community building adventure. We formed a caravan of our cars and safely made it to our homes in the valley. We will all remember this experience…. I am sure. Note: All of next year, I will be working on my book “Images of Our Time” a book of my grandmother’s pioneer history and her photography. 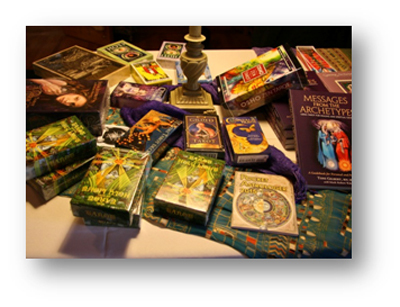 The next Northwest Astrology & Tarot Salon is planned for the “early” fall of 2016 when the weather is warmer. I am very happy to see that this unique concept worked out well! Wishing you a productive 2015!